For more information visit her website www.shannonkopp.com and follow her on Facebook and Twitter. "The dogs don't judge me or give me a motivational speech. They don't rush me to heal or grow. They sit in my lap and lick my face and make me feel chosen. And sometimes, it hits me hard that I'm doing the exact thing I say I cannot do. Changing." Pound for Pound is the inspirational tale of one woman's journey back from the brink of self-destruction, and a heartfelt homage to the four-legged heroes who unexpectedly saved her life. For eight years, Shannon Kopp battled the silent, horrific, and all-too-common disease of bulimia. Stuck in an endless cycle of bingeing and purging, Shannon was overwhelmed by broken promises: to herself, to her family, to her future. 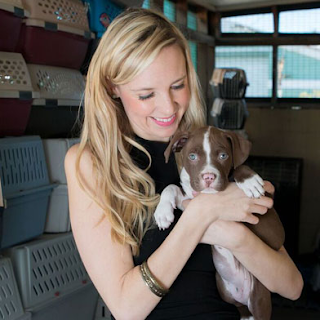 Finally, at twenty-four, she got a job working at the San Diego Humane Society and SPCA, where in caring for shelter dogs, she found the inspiration to heal and the courage to forgive herself. With the help of some extraordinary homeless animals -- dogs like Sweet Pea, Big Girl, Abby, Stewie, and countless others -- Shannon realized from her suffering, something beautiful had been born. Compassion. 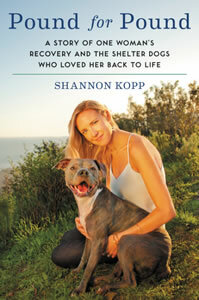 Shannon's poignant memoir is a story of hope, resilience, and the spiritual healing animals bring to our lives. Pound for Pound vividly reminds us that animals are more than just friends and companions -- they can teach us how to savor the present moment and reclaim our joy. Rich with emotion and inspiration, Pound for Pound is essential reading for animal lovers and everyone who has struggled to change.